bebop spoken here: Remember when Chris Barber played for Middlesbrough? - he still does! Remember when Chris Barber played for Middlesbrough? - he still does! Things are looking up for 'The 'Boro'. Joint leader of The Championship and through to the next round of the League Cup. Middlesbrough is a football town and yet, they've never quite achieved their potential. Remember that season back in the days of Juninho and Ravanelli when they reached two cup finals, losing both - one after a replay - and were relegated? How heartbreaking must that have been for 'Boro fans of which I was one? A few years earlier, there literally was a great triumph. The 1978 weekend at Ayresome Park where promoters Andy Hudson and George Wein brought the Newport Jazz Festival to Cleveland. Not Cleveland, Ohio, but Cleveland UK! The memories of that weekend will live forever in the memories of those who were young enough, at the time, to be there. It was a very good year and I was young enough. Festivals have come and gone since then but never has there been a one in the northeast to host so many great bands and artists. To misquote a Blossom Dearie song; Rhode Island is Famous For You - Middlesbrough. Forty years on, the magic is being recreated in the refurbished, and somewhat more grandiose, surroundings of Middlesbrough Town Hall. 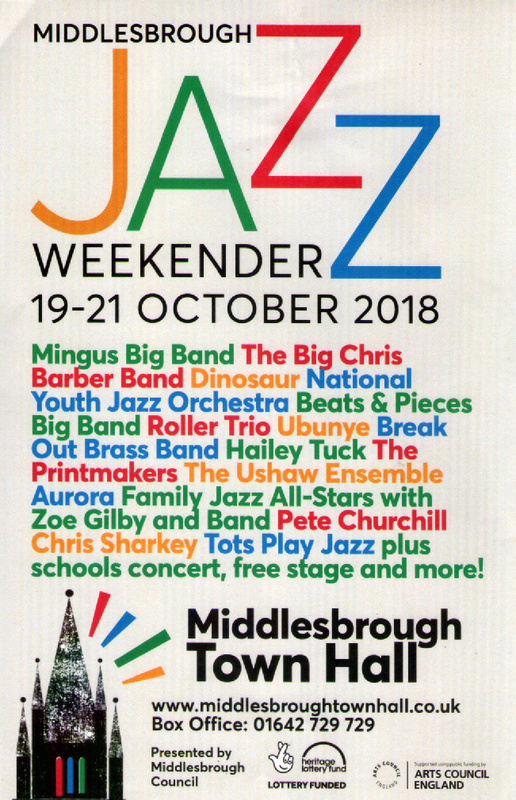 Although most of the performers and the audience back then are probably long gone - Chris Barber and I, along with promoters Hudson and Wein being notable exceptions - nevertheless, an exciting October weekend (19th - 21st) lies ahead. Radio Tees has got behind the whole thing and yesterday, presenter Bob Fischer spoke to trumpet player Noel Dennis and myself. You can hear Noel and I being interviewed on the BBC iplayer. The festival part comes on circa 2:00pm and my interview is at 2:30pm. Interesting placement on the poster of "Big Chis Barber Band" next to "Dinosaur"!